2008 Good Big Plot (Monster Mix) remarkably healthy and thick - great action. 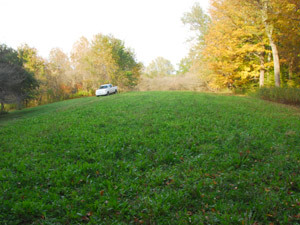 Small food plot remained a disaster. 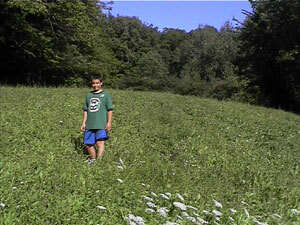 Well it all boils down to hunting season in 2008 and our Big Plot is in fantastic shape. The small plot never improved. Hunting the plot was amazing, resulting in some of the biggest rack bucks ever seen on the property. Given this plot is in Northern Pennsylvania these results are incredible! We had left our game cam up on this PA property after we had left last September and we had captured some impressive buck activity! 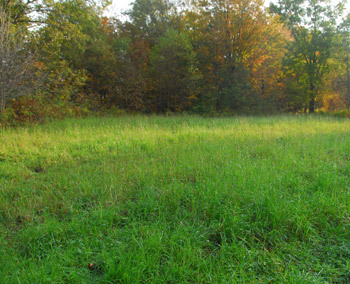 The small food plot was a no-show. 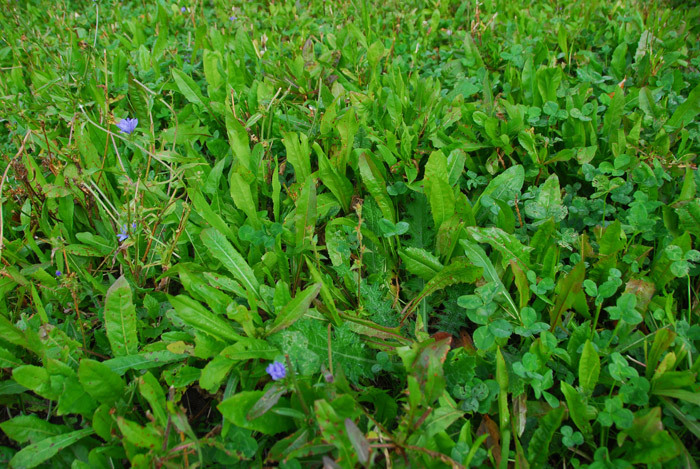 The clover was incredibly sparse and the annual rye grass completely took over the area. 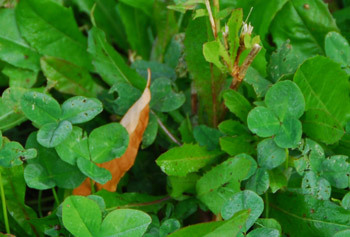 I will totally concede my mistake if the clover doesn't come up in the spring of 2009. 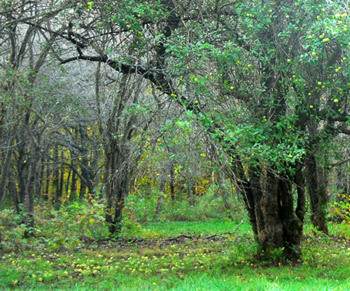 The food plot was also surrounded by several wild apple trees. 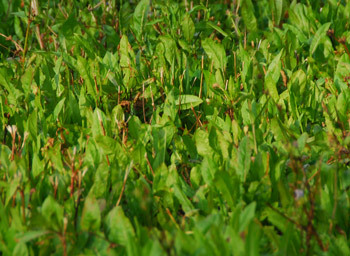 This years' crop was especially abundant and provided a secondary food source to compliment the high protein content found within our food-plot. Hunting with my good friend Bill Gaunt is a tradition at my McKean County property here in Northern Pennsylvania. There is a small parcel of game lands across the street and it is our tradition to do our morning hunts on the game lands and our afternoon hunts on the food plot. Since I failed to draw an antlerless tag I sat out the morning hunt and so did Bill. Our opening day started that afternoon on the food plot. I decided to hunt a Summit X-Pod on the little food plot and Bill would hunt a new stand I put up that had a shot at both the food plot and a big apple tree. Both stands were on the south end of the plot and were perfect for the North wind we had that day. 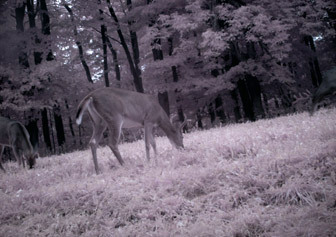 After sitting for several hours I saw, what appeared to be, a really nice buck around 100 yards away but nothing close. Meanwhile on the Big Plot, Bill had an entirely different experience. It was only 5PM and the sun was still up in the sky. 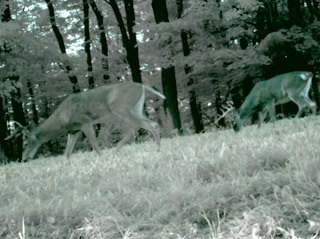 He had 2 legal bucks show up and they literally ran right into the plot and began feeding. He made a perfect shot on the smaller of the two. 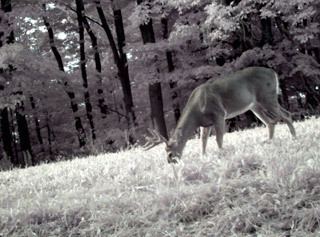 It was the buck that we had seen several times on our game camera photos. The other buck was a little bigger and we would see him again by the end of the hunt. 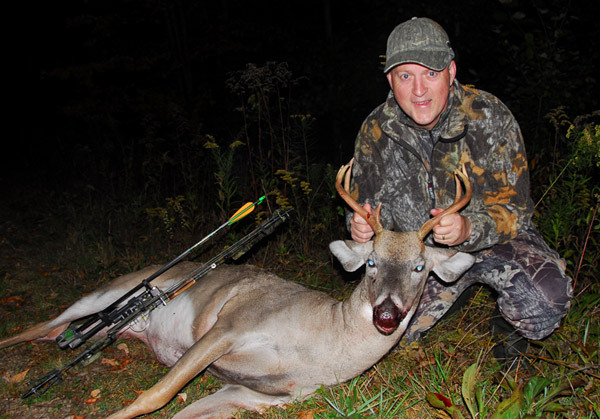 Bill Gaunt took this nice legal buck from the PA Food Plot. We had hunted the game lands on Monday morning and saw nothing so we were both looking forward to our hunt on the plot. Bill and I switched stands for our Monday afternoon hunt. 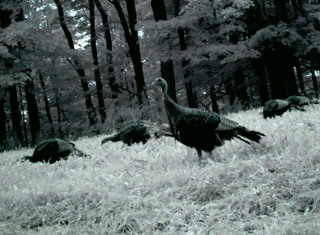 But with the exception of a flock of turkeys nothing had shown up at the Big plot. It was another perfect north wind too -so I was disappointed. Bill was hunting for a doe and no deer showed up as well. Today was our last day of hunting. Due to work and business commitments we had to leave Wednesday morning. So I decided to make the most of the day and I headed up to the plot for both the morning and the evening hunt. This is not typical for us, the deer are typically there during the early morning hours and getting to the stand is near impossible. I decided to risk it due to thick fog and very quiet conditions. I was able to pull it off but soon realized that this may have been a mistake. The wind was swirling badly as the morning thermals met at the top of the mountain where this plot is located. A deer had appeared around 9:15am. It was on the opposite side of the apple tree and coming straight at me. If it was a doe, I'd be sitting it out. But I never did find out what it was. The deer winded me before I was ever able to get a good look. I stayed in the stand until noon and that was the only deer I saw. For our last afternoon hunt Bill and I decided to hunt together, 50 yards apart. I took the stand he killed his deer from on opening day and he took the Summit X-Pod across from the apple tree. Late into our last hunt a buck showed up under my stand. He was a legal buck and he was very close. But I had no shot right away and would need to wait at least 10 minutes for the buck to give me a good angle. Meanwhile, to my right, I could hear more deer coming out of the woods. I was so close to the legal buck to my left that I didn't dare look up at them as they entered the food plot. But when the buck eating apples moved back to a poor angle I decided to turn and get a look at the deer now feeding in the plot. The first deer was a very nice buck. I had no shot at him. The second deer was the biggest deer I had ever seen in Pennsylvania. I almost fell out of the stand. The other two bucks were seen on my cam photos, but this big one was a total shock. The problem was I had one hole and a long shot for me (30 yards). I also had the buck still under my stand to the left. But I decided that this opportunity was too good to pass up. I risked getting busted by the close buck and drew my bow and waited for the big boy to step into the shooting lane. He did and I made a perfect shot. 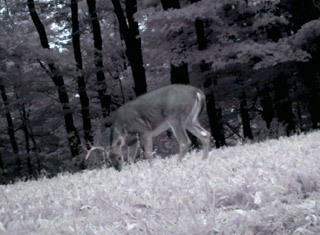 The buck never left the food plot. 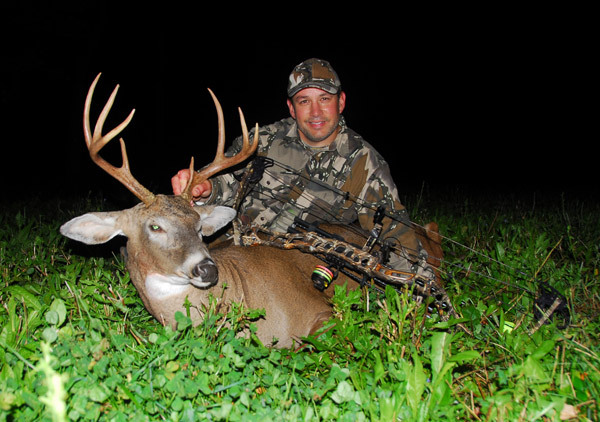 Pat Lefemine shot this buck from his PA Food Plot. It was the largest buck ever seen in 15 years on this property. 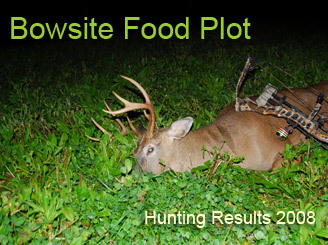 Conclusion - do you think our food plot worked well for us this year? You bet it did. However we also agreed that for the first time in several years we have been seeing some really impressive rack bucks and we believe it's due, in large part, to PA's antler restrictions. This property is only 30 acres and is surrounded by public land, private, unposted land, and the hunting pressure is intense. 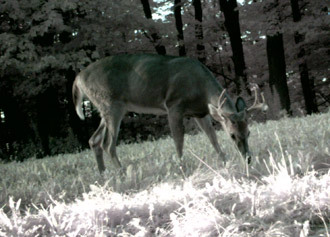 Seeing bucks like this on our food plot was a long time in the making. But having a hand in making bucks like this, in a state not know for quality bucks, is extremely gratifying. You bet we'll be back next year with a whole new plot strategy.